LAFAYETTE, Ind. — Gov. Mitch Daniels will make a presentation during a town hall meeting Friday in Downtown Lafayette, state Rep. Randy Truitt (R-West Lafayette), said today. 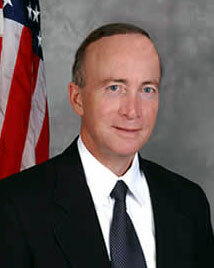 Governor Mitch Daniels will attend a town hall meeting at the Lafayette Theater on Friday, March 6. The town hall meeting at 10:00a Friday in the Lafayette Theater, 600 Main St. , Lafayette, is sponsored by Reps. Truitt, Tim Brown and Sheila Klinker and state Sens. Ron Alting and Brandt Hershman in conjunction with Greater Lafayette Commerce. The forum will focus on property tax caps and local government reform. Gov. Daniels will give a 20-minute presentation, followed by a 40-minute question-and-answer session. Gov. Daniels asked the Indiana Commission on Local Government Reform to develop ways to streamline local Indiana government. He asked two of the state’s most prominent citizens – former Gov. Joe Kernan and Chief Justice Randall Shepard – to lead the charge.